Kris Evans & Dolph Lambert dildos are back in stock at Fleshjack and 25% off but only while supplies last! Now is the time to grab hold of your own bit of Kris or Dolph. Pick up your favorite underwear styles this weekend in the Skiviez weekend clearance sale. 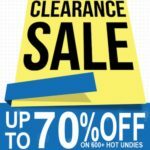 You can save up to 70% off the latest underwear styles from a wide range of underwear brands. 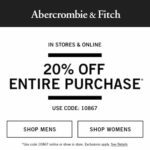 Happy Sunday shopping… at Abercrombie and Fitch. Take 20% off your entire purchase today with the promo code 10867. Today only save up to 60% off men’s underwear at Skiviez + they have new 2(x)ist underwear styles in stock and on sale.